Organic sweetener from the blue Webber agave plant. Great in hot drinks and cereals. Agave nectar loves you all - vegetarians and vegans. Kosher - KLBD.Our delicious Agave Nectar comes straight from the organically grown Blue Webber Agave Plant in Mexico. It makes a pretty groovy alternative to refined brown sugar and artificial sweeteners. Drizzle. Mix. 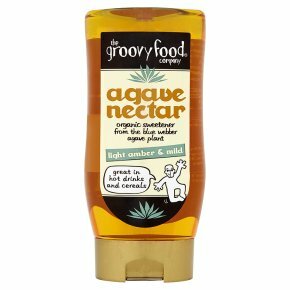 Cook Drizzle Agave Nectar Light and Mild over food, stir into drinks or use in baking.